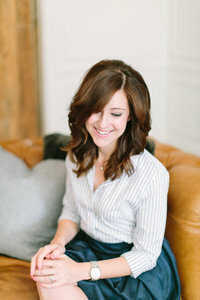 Welcome, and thank you so very much for stopping by to check out the new Lindsay Bishop Events website and blog design! First, if you’ve been following along with me on Instagram over the past week, I just want to say thank you! Thank you so much for being a supporting factor in my journey. I hope that you’ve enjoyed getting to know more about the heart behind Lindsay Bishop Events, and why I love helping couples intentionally plan and design one of the most memorable days in their lives. While the Core Values that I shared have always been present in my business, they haven’t necessarily been reflected in my online presence. The old Lindsay Bishop Events website may have been pretty, but as I evolved as a wedding planner, designer, and as a person, the disconnect between my website and the why behind it grew. When I begin the design process with each of my couples, one of the first questions that I ask them is “What colors would I find in your closet?” As soon as a couple gets engaged, they’re instantly inundated with photos of gorgeous weddings in magazines, and snapshots of killer styled shoots on Pintrest. But, by talking about things like what they wear every day, or what their favorite piece of furniture is in their home, I’m able to dig a little deeper into who they are in their daily lives. It’s always each couples’ goal to make sure that, when their guests arrive at their wedding, they know whose wedding they’re arriving at. It should feel like them. But, with all of these outside influences, it’s easy for a girl who has a wardrobe featuring the colors black, white, and black to get caught up in the idea of a perfectly pretty pink wedding. Which is, unfortunately, the exact thing that’s keeping their wedding from feeling like it’s theirs. Well, without even noticing it, I had broken the most important design rule. I had packaged Lindsay Bishop Events up in a pretty blush website, tied with a lace bow, and sent it out into the world. Why? To be honest, it’s hard for me to even remember how it happened. Maybe it started because I thought that’s what I needed to do in order to appeal to the brides I wanted to attract. Or, maybe it stemmed from seeing so many wedding professionals with light, airy websites, that I felt it was what I was supposed to do. I was the girl with the black and white (ok, navy and white!) wardrobe throwing a blush and bashful wedding, and blending in with everyone else. Even though I started the process of refreshing my brand almost a year ago, it wasn’t until a wonderful friend of mine asked me to be a part of a photo shoot this past March that I really understood how needed this change was. She asked me to flex my design muscles in a way that made me feel a little uncomfortable, and in turn, made me realize how much distance there was between that lovely website, and the person behind the screen. 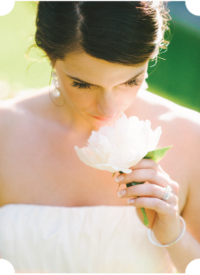 You see, I don’t plan and design weddings because I love pretty things. I chose this career for the moments. I want to make sure that a mother can spend a stress-free morning with her daughter on her wedding day, so that she’ll have those memories to look back on for years to come. I want to make sure that a bride and groom have a sliver of alone time during the whirlwind that is their wedding day, so that they can quietly celebrate the commitment that they made before being all caught up again in the hugs and laughter of everyone they love. And, I want to help design a wedding that feels like the wedding of two people in love, from the moment that their guests arrive. I want to ask meaningful questions, and have a little more weight behind the answers than “it’s so pretty”. I want to talk about why you’re drawn to all of those gorgeous blush pictures on your Pintrest board. Maybe it’s because they feel romantic, maybe it’s because they feel feminine, or maybe it’s because they feel sweet. I want to help uncover the why behind what you love, so that we can find a way to take those images and transform them into something that feels like you! This time around, I made choices that reflect who I am as a person, and as a designer. Clean, classic, and without all the frills. Most importantly, this new site shares a lot more about what makes Lindsay Bishop Events different. From the “Lindsay Bishop Bride” facts at the top of the Details Page (one of my favorite parts! ), to our Philosophy, to the Favorites at the bottom of the Meet Us Page, I wanted to make it easier for each of you to know who I am. More importantly, I wanted to make it more apparent why I love each and every one of the couples that I work with the way that I do. LOVE the redesign!! Also, that is so funny I do the same thing with my couples who are struggling with their color palette! I say “I’m standing in your closet, what colors are surrounding me?? ?” I am loving your true-to-yourself vibe on this rebrand. I think we are all so guilty of falling into that “trendy” trap where we get stuck being something we aren’t and projecting that towards our clients! I love the sleek and sophisticated look of the site. Bravo! You are so awesome! I am so glad to see another creative take a step back and refocus themselves onto what matters most. I, too, have felt the same way with the light and airy pretty things. Don’t get me wrong, I love some pink, but I tend to have more darker likings. I mean to answer your questions as to what is in my closet…black… lots of black. Thank you for being transparent on your blog. We need more that in our industry! Much love as you journey on being the best YOU! Yay! I love the new look! It’s so “you”! This is all so beautiful Lindsay! Can I just say, I love that you ask clients what is in their closet. I think that’s so smart and you get to know their personality and style a little bit more. Also, I LOVE that you describe what a Lindsay Bishop bride is on the Details Page. So good!